Hello, I would like to change the network card of my Lenovo Y510P to have better support for Windows 10 (with the current one is a continuous disconnection from the internet). If I could find one with Wi-Fi ac and Bluetooth it would be better: I read, however, that the Bios may not recognize the replacement cards, and that you should fix it by flashing a Bios modded. Can someone clarify the ideas and suggest a good wi-fi card? Thank you. We do not recommend to our customer to flash a modded BIOS on their computer because it will cause hardware failure. 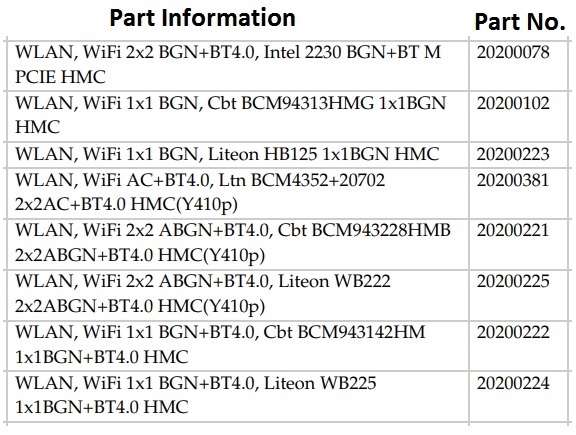 Regarding the compatible WLAN card for your laptop kindly check the list below. We still recommend getting those that are listed in the manual, as those are tested to work with your laptop. There's nothing wrong in trying that Wi-Fi card, that was suggested by other users, especially those who have been using it in the same model without having issues. Make sure to check the return option as well if you'd like to get that. Thank you, very kind of you to answer. I will keep you updated on the evolution and outcome of the matter. Glad to hear that the upgrade is successful. Should you need any help, don't hesitate to post back in the Community.